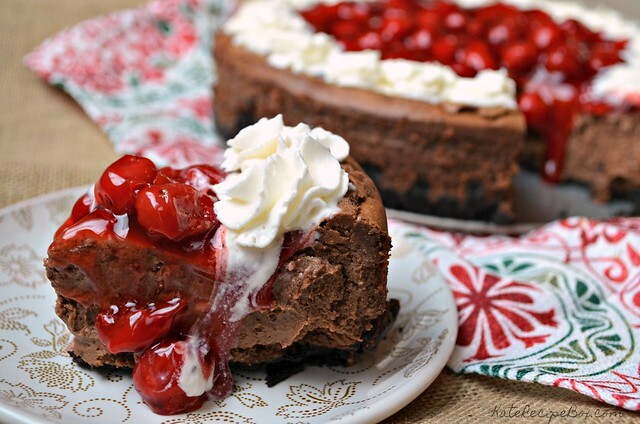 This cheesecake is decadent – rich, silky chocolate, topped off with whipped cream and cherries. It’s a showpiece dessert for your table, without putting in a ton of effort. If you’re feeling overwhelmed by holiday prep, this is a great candidate for your menu. Make it the weekend before Christmas and give yourself the gift of one less thing to worry about. And if you’d like to scoop up a fun, #ChristmasSweetsWeek gift for yourself, make sure you’ve entered the giveaway here: a Rafflecopter giveaway All of the sponsors for #ChristmasSweetsWeek have been super generous with the prizes they’re offering up to readers! In a medium bowl, mix together the crushed cookies and melted butter until thoroughly combined. Press into the bottom of a spring-form pan. Bake for 10 minutes, then remove to cool. In a microwave-safe bowl, microwave the chocolate chips at half power, in 30 second intervals, until melted. Stir after each 30 second interval. Set aside. In the bowl of a stand mixer, beat the cream cheese until smooth. Beat in the sugar until fully incorporated. Add in the salt, sour cream, and vanilla and beat until fully incorporated. Pour the slightly-cooled melted chocolate into the stand mixer and beat until fully incorporated. Beat in the eggs, one at a time, until just combined. Pour the filling into the prepared crust. 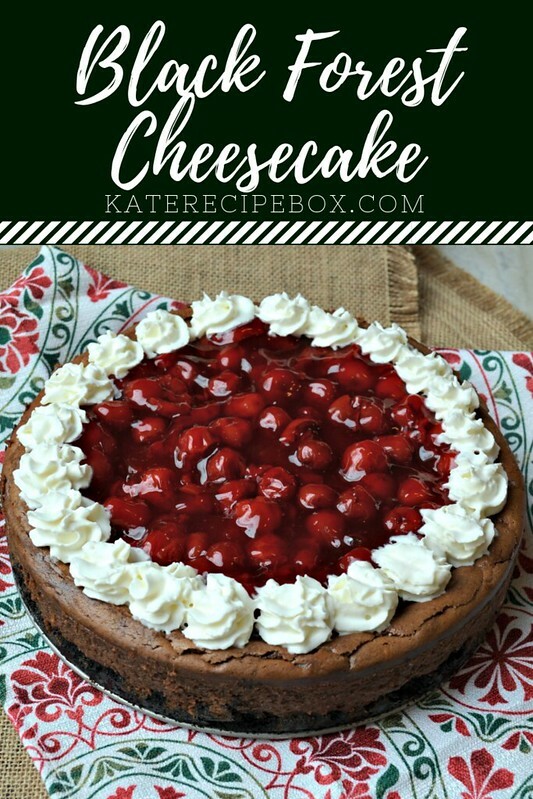 Bake for 55-65 minutes, until the center just barely jiggles when the cheesecake is moved. Remove from the oven and let cool for 30 minutes, then wrap and transfer to the refrigerator to cool overnight. 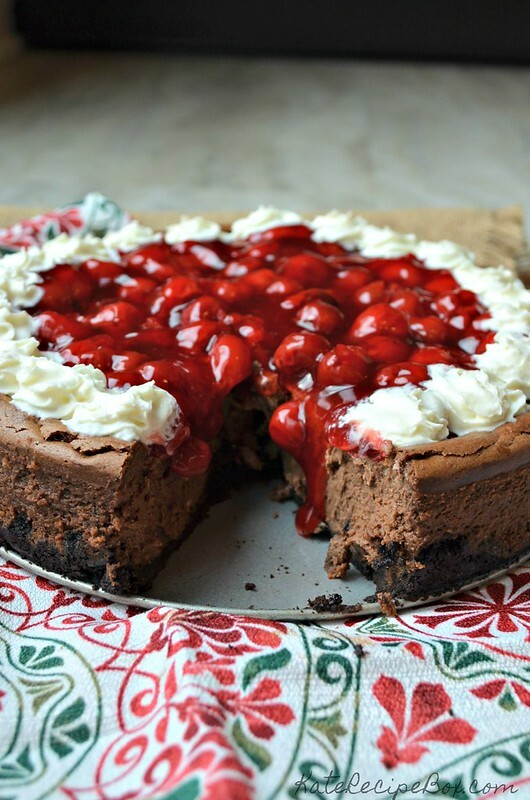 When ready to serve, top with whipped cream and cherries. 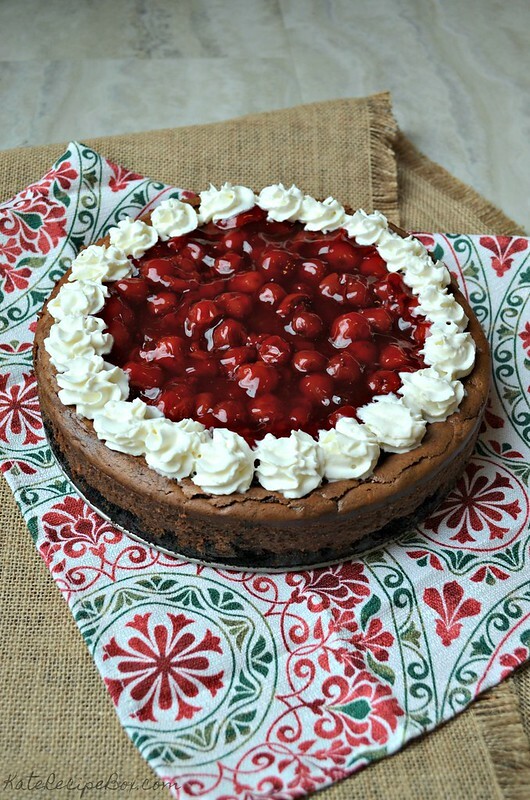 Mmmm those cherries just oozing down the cake is making me drool!! !